Almost sixteen months ago, I experienced a tumultuous low in my life. I had a miscarriage with twins, contemplated quitting running and told a few of my loved ones that this would be my last season. I’d break the news to my once intimate following on Running Fat Chef that I was leaving this sport forever. However, those plans were disrupted by a heckling spectator at the 2017 NYC Marathon. Although the brief altercation of being fat shamed was terrible, it was a life altering experience that forced me out of my self-defeatist comfort zone. Sharing this terrible experience made me viral overnight to a community who didn’t know I existed. 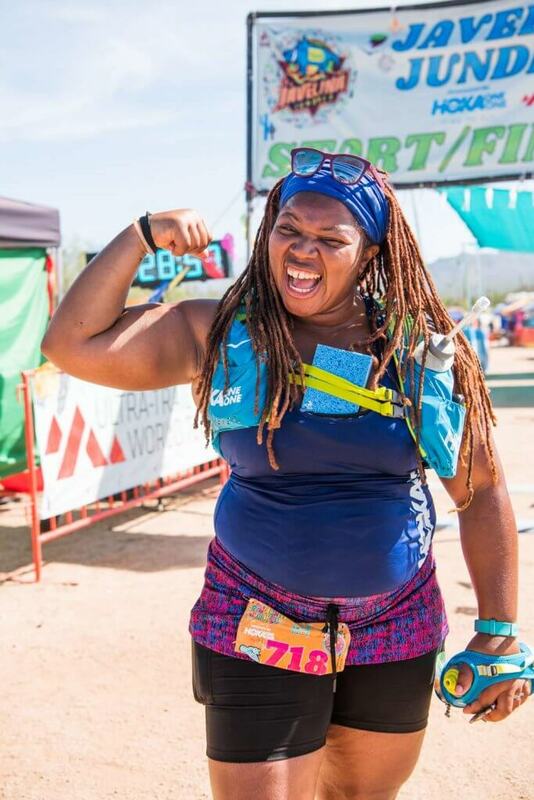 Before I knew it, I became an accidental activist for the body positivity moment and one of the many voices for the back of the pack runners — I never looked back. 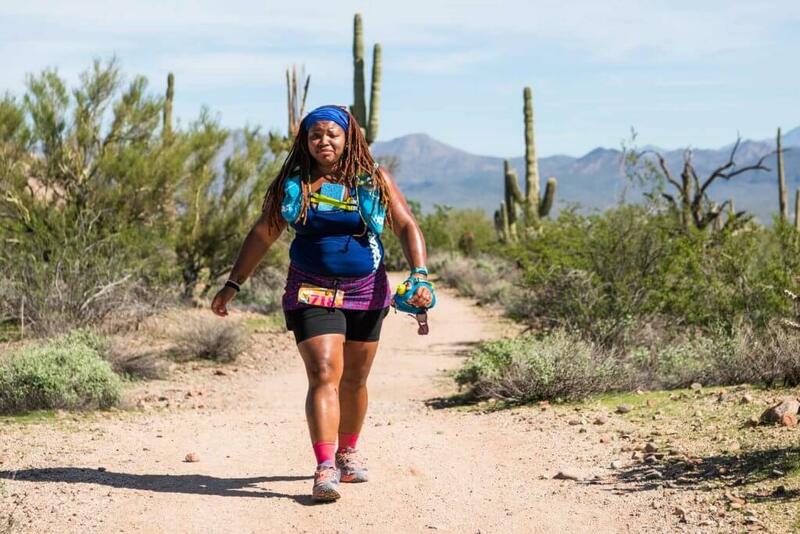 Before this series of events, I had read a copy of my ultrarunning buddy’s book where she talked about her first 100K race and proclaimed it was a “party in the desert.” Despite loving her story, I came to my own definition of why people like her did it: insanity. I thought any person who was willing to sign up for a 100K has to be a borderline idiot. 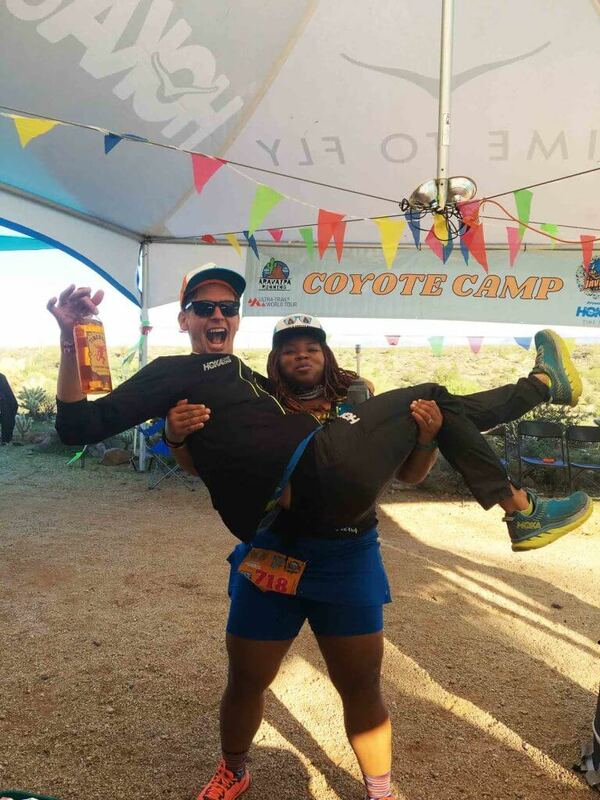 Post NYC, my buddy jokingly pestered me about the 100K she had completed, the Javelina Jundred 100K. It is a race in Fountain Hills, Arizona with a multi-loop course and a generous 29-hour cut off designed to prevent delirious participants from feeling isolated. This race started to sound desirable, and less than a few months later, I embarked on this crazy adventure. 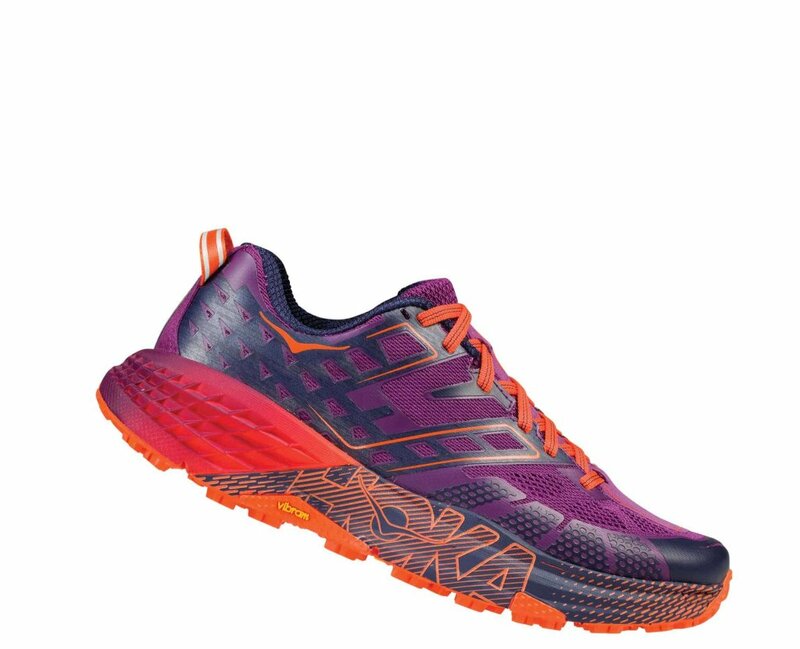 I used a regiment crafted by HOKA Athlete Megan Roche and started training in April. When I arrived in Arizona, visiting the expo was electrifying. Unlike the road races that I’m used to, the Javelina Jundred expo was intimate but buzzing. I was greeted by five elite athletes, all of who participated in the festivities through running or volunteering on the course. When race day arrived, I watched the 100 milers take off. They looked like moving Christmas lights scurrying around McDowell Mountain Regional Park. Before I knew it, I was at that same start line ready to take on 100K. I’m used to watching people pass me on the course, but being a back-of-the-pack runner has its pressures. To some, if you’re not running fast enough, you are a glorified walker. At 5’3 and with a 240-pound muscular frame, the fact that I identify as a runner is comical to some. People like me are suggested to lose weight, scolded to move faster and accused of eating too much or lacking discipline. None of these factors stop me from running — in fact, they fuel me. Such statements convinced me to use my first 22-mile loop as an ode to some of the worst things that I had read or heard directed to friends, family members, my social media followers and at times, myself. In so many ways, I thought that anger would push me through. This perspective changed when I linked up with a fellow back-of-the-pack ultrarunner named Lisa. She showed me a personal note that she wrote to propel her throughout the course, which included a reminder to smile. Although Lisa didn’t know it, our conversations and breaks of silence replaced my angry intentions. Plenty of endurance athletes use these events to confront their personal demons. However, life handed me a smoother alternative option when I met Lisa. My first loop gave me many first-time experiences. Ten minutes away from Coyote Camp, I saw what appeared to be a dog dart off in the distance. It was actually a coyote. Surprisingly, I wasn’t scared but fascinated. Reaching our first aid station, Lisa and I indulged in a shot of Fireball, a random shot of whiskey and a cup of IPA with HOKA Athlete Tim Tollefson. 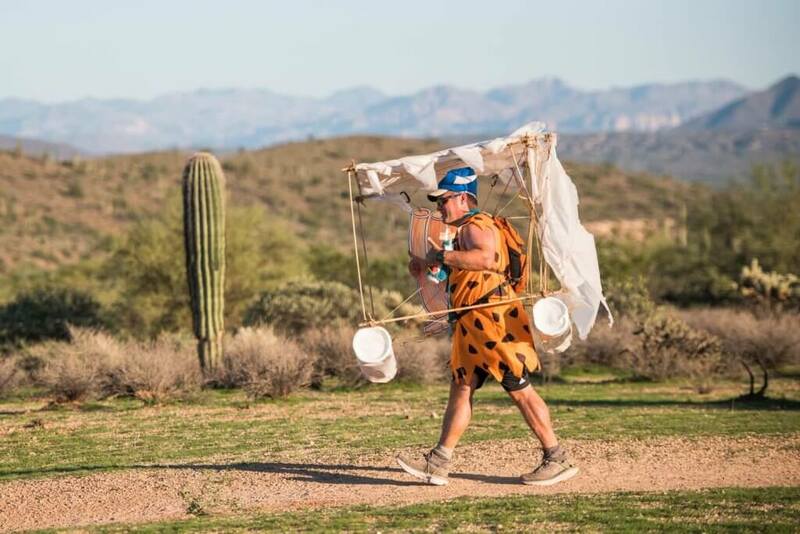 We saw runners who dressed in costumes prancing through the desert. Pumped with energy, we iced our bodies in preparation for the rapidly growing Arizona heat. Lisa and I parted, and the sun whipped my body into submission. The heat was growing more oppressive by the moment. Suddenly, it dawned on me that I had another 39 miles to go. I hit a wall, and my mind danced with the idea of giving up. I thought about the excuses that I could tell my friends and family members, but my heart didn’t feel right about it. When I left Rattlesnake Ranch, my silence became a burden, and I opted to play music from my phone. Notifications started rushing in on my phone. I had decided to dedicate my second loop to slow runners and tears streamed down my face as I allowed hundreds of messages to fuel me. I shuffled my blistered feet through the sunset until I hit Jackass Junction. Clearly “the party in the desert” wasn’t a joke; Jackass Junction could be heard from a quarter mile away. The lights were shining and people were dancing inside the tent. I sat down, and two volunteers came to my side offering two cheeseburgers and two cups of coffee. A mile after leaving Jackass Junction, two hot dogs rushed past me, one of which was HOKA Athlete Tim Tollefson. He asked how I was feeling, and I assured him that I was doing okay. I trekked on through the night. The stars spoke to me, and the shift in the temperature brought me to a calm. The loop-style course served me well as runners moving in both directions exchanged supportive messages. The ultra community is unique in that way. For the first time, I felt like I truly belonged with other runners. Slightly after midnight, I finished loop two. My feet were inflamed, and a few suggested that I take a nap before heading back out to the course. I had hoped to finish the course before the 24-hour mark, but at that point, I just wanted to finish and push my body further than I ever had. After a two-hour break, I received my final lap bracelet and headed back out on the course. My headlamp died. In complete darkness, I used my phone light to navigate through the trails. I told myself to remain calm. Finally, I was greeted by the sunrise. The heat started to pick up, and I wanted this race to be over. I called my husband for words of encouragement. He reminded me that my last loop was for me — the woman who dropped out of high school because of seven missing gym credits. With 2.75 miles remaining, I felt like I was walking on nails. I had an hour and a half left to make the cutoff, and I refused to be pulled off the course. I dug deep, pushed past the sound of my grunts and speed walked my way through. I could hear music playing, and I thought it was my imagination playing tricks on me. As I arrived at Javelina Jeadquarters, the banners were still up, and I was amazed at how many people were still there to cheer me in. I was overwhelmed with emotions. Nobody cared that I was a plus-size athlete or that I was the last runner on the course. I was a 100K finisher. I love the sense of inclusion I felt in a sport where you don’t typically see bodies like mine. Even though a 100K still makes me nervous, I’m looking forward to a new goal: 100 miles. Perhaps being a “borderline” idiot isn’t such a bad thing after all. Shop the shoe Latoya conquered her first 100K in, the Speedgoat 2.